Reef Balls that will be used to establish new reef sites along the Florida Gulf Coast. Florida lays claim to the third largest barrier reef system in the world. This Florida Reef is the only living coral barrier reef in the continental United States and is approximately four miles wide and 170 miles long. Within this ridge of coral, sand, and rock lies nearly 6,000 smaller reefs; many of which are 7,000 years old. This spectacular ecosystem, as well as surrounding reef systems along the Florida coastline, are falling prey to pollution and a global increase in carbon dioxide. Coral makes up the majority of the reef system and requires clean and clear water to survive. When sediment and other pollutants enter the fragile ecosystem, the coral slowly suffocates. Simultaneously, a toxic environment is created that fosters the growth of harmful algae. According to Oregon State University, this damaging algae introduces foreign pathogens that significantly slow the growth of coral. Further, the destructive algae reduces the levels of helpful bacteria within the ecosystem. The healthy bacteria are the coral’s primary food source and without a consistent supply, the reef becomes more susceptible to starvation and illness. Coral’s predominant source of contamination derives from Florida’s numerous rivers and streams that flow into the Atlantic Ocean and Gulf of Mexico. These tributaries carry dangerous toxins from farms, landfills, illegal dump sites, and other manmade sources, depositing them into the coastal waters. Carbon dioxide is also proving to be a significant threat to reef ecosystems. As the atmospheric levels of Carbon Dioxide increase, ocean temperatures also rise and upset the delicate environment in which coral depends on for survival. According to an analysis conducted in part by Duke University, the side effects of increased Carbon Dioxide will result in the death and significant damage of coral reefs on a global scale. Chris Langdon, of the University of Miami, asserts that Florida’s reefs are susceptible to the same fate and have already shown evidence that they are beginning to die off. The death of these ecosystems will endanger more than 100 coral species and over 400 different varieties of fish and marine organisms that live in and around the coral reefs. Armed with this knowledge, Cole Kolasa created his own conservation initiative with the goal of improving reef systems along the Gulf Coast of Florida. Cole, a Sophomore and Marine Biology student at the University of Central Florida (UCF), says that witnessing the devastation of Florida’s coral reefs inspired him to start his own reef conservation crusade. 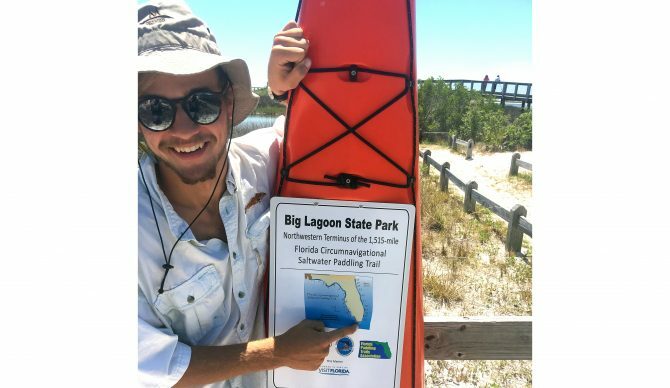 With the assistance of his father, and a gofundme campaign, Cole made a plan to paddle his kayak from Big Lagoon State Park in Northwest Florida to Long Key State Park in South Florida. After three months of preparation and with the support of his sponsors (Sun Bum Sunscreen, Travel Country Outfitters, and Wagen Tech), Cole pushed off on the morning of May 8th, 2017. A limited budget required Cole to get creative with his nightly lodging needs, so he camped on beaches, crashed with friends, and even stayed on a stranger’s sailboat once. Cole spent 46 days on the water and during that time he came within arms-reach of a 12-foot hammerhead near Mexico Beach, was almost eaten alive by mosquitos in the Everglades, and negotiated severe headwinds, large surf, and strong currents. Yet, of all his dangerous encounters, Cole says that his most hazardous confrontations were with careless boaters who held little regard for speed limits and other mariners. Unfortunately, Cole was only able to make it as far as the Everglades National Forest. An early tropical depression formed, creating conditions that were far too rough for Cole to continue his journey. The effects of the storm damaged Cole’s kayak beyond repair, forcing him to shore, and much of his gear was lost or destroyed. Despite the challenges, Cole travelled a total distance of 788 miles and raised an impressive $3,140 for his reef conservation project. Cole says that he and his father, Keith Kolasa, who is the Aquatics Resource Manager of Hernando County, plan to use the funds to create artificial reef molds. The molds will be used to produce an infinite number of concrete “reef-balls” that will be placed near central Florida’s gulf coast. Keith states that a conservation project of this magnitude has not been completed in the area since 1997. Cole and Keith hope to engage local youth in their efforts by partnering with summer camps being conducted in Hernando County, Florida. With the help of the students, Cole and Keith plan to have the reef-balls in the water by the end of Summer 2018. It is their hope and expectation that these structures will provide permanent homes for new coral colonies, prevent the overfishing of existing reefs, and offer protection to sea creatures living in the area. Preservation efforts like Cole’s bring great hope and inspiration to the marine conservation community. In fact, numerous teams and organizations around the world are conducting research, raising awareness, and implementing new reef preservation projects intended to reduce the impacts caused by manmade hazards and adverse global changes. The responsibility of repairing and maintaining the health of the world’s coral reefs can, and should be shared by all. Note: You can still make your own donation to “Kayaking for Conservation” here, or visit the “Florida’s Adventure Coast Site” to see the full story on Gulf Coast Artificial Reef Development and Future Plans here.